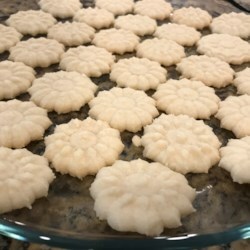 Wonderful shortbread cookie! These were so easy to make and yet turned out fabulous. It's great when such simple ingredients come together to create something so delicious! I followed the recipe exactly and let the dough chill in the fridge for a half hour before rolling it out and using cookie cutters vs. a cookie press. I baked the cookies on parchment paper and they were perfectly done in ten minutes. These have a wonderful butter flavor and are great for decorating. When I was all done I placed them in clear cellophane bags tied with ribbon - too cute!